I have a excel sheet with data on it and would like to print in A4 and A3. When go to file print and preview selecting A4 , it has all the information , but shrinked to 70% of the A4 page. If I select the A3 paper only 50% of information is shrinked to this A3 page. Is it possible to spread all the information across the A4 and A3 paper and are there ay settings that I need to do. You can always force the information on the page (obviously will be printed much smaller). On the Excel sheet itself, set the print area before printing. 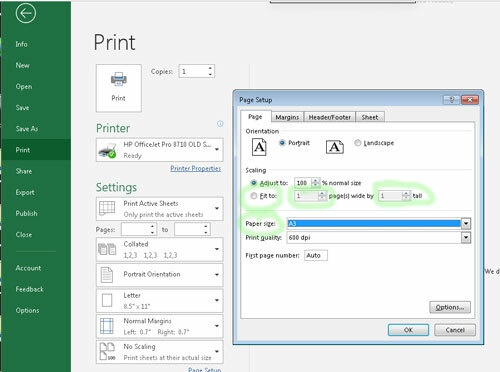 During the print dialog, select Print Selection to your selection and in the bottom, Fit Sheet on One Page. I'm guessing that Excel has a Print Area set from the first print you did. Try clearing it, by clicking the Page Layout tab, then Print Area > Clear Print Area. While you are at the Page Layout tab, also set the paper size by clicking the Size button. If the paper orientation is wrong, set it there, too. Unless something has changed and I completely misunderstand your question, the Print and Page Setup dialogs not only lets you set A4 or A3, but on how many pages tall and wide. If you set it to 1x1 it will shrink as needed to fit on the page. Simply increase the number of pages in each direction.